Piers and docking facilities serve important functions along the coast, allowing access to water for recreational and commercial boating, swimming, diving, fishing and transportation. If poorly designed, however, piers and docking facilities can obstruct navigation and the water circulation that sustains an estuary's natural systems. The type of permit you will need for a piers or docking facilities varies with the size of the structure. See the tables in Appendix A to help you determine the type of permit you may need. Piers cannot be wider than 6 feet. Wider piers may be permitted only if the greater width is necessary for safe use, to improve public access, or to support a water-dependent use that cannot otherwise occur. Piers in existence on or before July 1, 2001, may be braced with additional pilings and crossbeams to prevent or minimize storm damage, as long as the pilings do not extend more than 2 feet beyond either side of the pier. Piers and docking facilities extending more than 100 feet past the marsh vegetation or the shoreline must not extend beyond the length of existing piers used for similar purposes along the same shoreline. Piers and docking facilities must not extend into the channel portion of the water body. 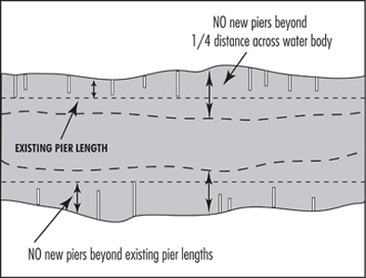 Piers and docking facilities must not extend more than one-fourth the width of a natural water body or man-made canal or basin (see Figure 4.9), except in cases where there is a federally established pier-head line or if the pier is located between longer piers within 200 feet of your property. However, if you qualify for one of these exceptions, your pier cannot be longer than adjacent piers and cannot in any case extend more than one-third the width of the water body. Pier and docking facility alignments along federally maintained channels must meet U.S. Army Corps of Engineers guidelines, available from the Corps' district office in Wilmington. The total square footage of shaded impact for docks and mooring facilities (excluding the pier) allowed shall be 8 square feet per linear foot of shoreline with a maximum of 2,000 square feet. In calculating the shaded impact, uncovered open water slips shall not be counted in the total. See the tables in Appendix A for more information. Piers and docking facilities must be elevated at least 3 feet over the coastal wetland substrate, as measured from the bottom of the decking. Boathouse walls may cover only the top half of the boathouse (from the roofline). The bottom half must remain open. Boathouses are not allowed on lots with less than 75 linear feet of shoreline. The total area of a boat lift cannot be larger than 400 square feet, unless you can demonstrate a need for a larger boat lift. Piers and docking facilities must be single-story. They may have roofs, but must not be designed for second-story use. Piers and docking facilities must not interfere with access to any riparian property and shall have a setback of at least 15 feet between any part of the pier and the adjacent property owners' areas of riparian access. 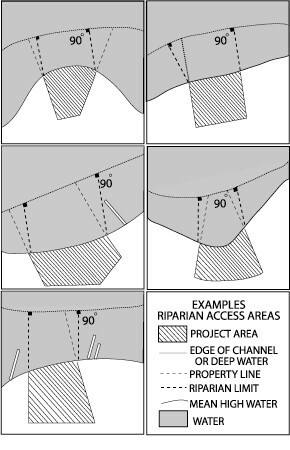 The dividing line for areas of riparian access shall be established by drawing a line along the channel or deep water in front of the properties, then drawing a line perpendicular to the line of the channel so that it intersects with the shore at the point the upland property line meets the water's edge (see Figure 4.10). The 15-foot setback requirement may be waived by a written agreement of the adjacent riparian property owners or when owners apply for a CAMA permit together. In areas where the shoreline is irregular, such as the end of a canal, DCM field representatives are responsible for determining the projection of the riparian property lines into the water, and will assist property owners in determining pier alignment. Piers and docking facilities must not significantly interfere with water flows, which could lead to the accumulation of pollutants along the shoreline or accelerate shoreline erosion. Piers and docking facilities with open-spaced pilings allow water to circulate freely. Piers and docking facilities must not interfere with shellfish leases or franchises. You must provide notice of the permit application or exemption request for a pier or docking facility to the owner of any part of a shellfish franchise or lease that the proposed pier or docking facility would cover. The Division of Marine Fisheries has information on the location of these shellfish beds and leaseholders.